The anomaly score of each sample is called Local Outlier Factor. It measures the local deviation of density of a given sample with respect to its neighbors. It is local in that the anomaly score depends on how isolated the object is with respect to the surrounding neighborhood. More precisely, locality is given by k-nearest neighbors, whose distance is used to estimate the local density. By comparing the local density of a sample to the local densities of its neighbors, one can identify samples that have a substantially lower density than their neighbors. These are considered outliers. Number of neighbors to use by default for kneighbors queries. If n_neighbors is larger than the number of samples provided, all samples will be used. metric used for the distance computation. Any metric from scikit-learn or scipy.spatial.distance can be used. If ‘precomputed’, the training input X is expected to be a distance matrix. Parameter for the Minkowski metric from sklearn.metrics.pairwise.pairwise_distances. When p = 1, this is equivalent to using manhattan_distance (l1), and euclidean_distance (l2) for p = 2. For arbitrary p, minkowski_distance (l_p) is used. The amount of contamination of the data set, i.e. the proportion of outliers in the data set. When fitting this is used to define the threshold on the decision function. If “auto”, the decision function threshold is determined as in the original paper. 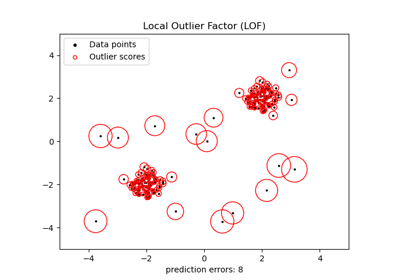 By default, LocalOutlierFactor is only meant to be used for outlier detection (novelty=False). 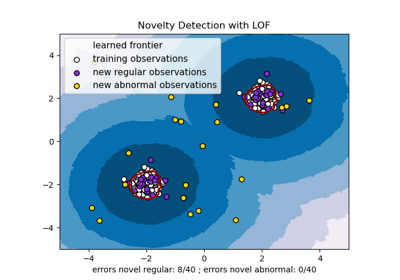 Set novelty to True if you want to use LocalOutlierFactor for novelty detection. In this case be aware that that you should only use predict, decision_function and score_samples on new unseen data and not on the training set. The number of parallel jobs to run for neighbors search. None means 1 unless in a joblib.parallel_backend context. -1 means using all processors. See Glossary for more details. Affects only kneighbors and kneighbors_graph methods. The opposite LOF of the training samples. The higher, the more normal. Inliers tend to have a LOF score close to 1 (negative_outlier_factor_ close to -1), while outliers tend to have a larger LOF score. The local outlier factor (LOF) of a sample captures its supposed ‘degree of abnormality’. It is the average of the ratio of the local reachability density of a sample and those of its k-nearest neighbors. The actual number of neighbors used for kneighbors queries. Offset used to obtain binary labels from the raw scores. Observations having a negative_outlier_factor smaller than offset_ are detected as abnormal. The offset is set to -1.5 (inliers score around -1), except when a contamination parameter different than “auto” is provided. In that case, the offset is defined in such a way we obtain the expected number of outliers in training. [Rca479bb49841-1] Breunig, M. M., Kriegel, H. P., Ng, R. T., & Sander, J. (2000, May). 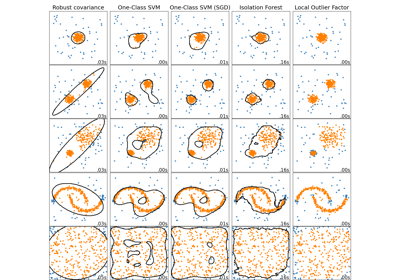 LOF: identifying density-based local outliers. In ACM sigmod record. fit(self, X[, y]) Fit the model using X as training data. kneighbors(self[, X, n_neighbors, …]) Finds the K-neighbors of a point. Shifted opposite of the Local Outlier Factor of X. Bigger is better, i.e. large values correspond to inliers. The shift offset allows a zero threshold for being an outlier. Only available for novelty detection (when novelty is set to True). The argument X is supposed to contain new data: if X contains a point from training, it considers the later in its own neighborhood. Also, the samples in X are not considered in the neighborhood of any point. The query sample or samples to compute the Local Outlier Factor w.r.t. the training samples. The shifted opposite of the Local Outlier Factor of each input samples. The lower, the more abnormal. Negative scores represent outliers, positive scores represent inliers. Fit the model using X as training data. “Fits the model to the training set X and returns the labels. Label is 1 for an inlier and -1 for an outlier according to the LOF score and the contamination parameter. The query sample or samples to compute the Local Outlier Factor w.r.t. to the training samples. Returns -1 for anomalies/outliers and 1 for inliers. Predict the labels (1 inlier, -1 outlier) of X according to LOF. This method allows to generalize prediction to new observations (not in the training set). Only available for novelty detection (when novelty is set to True). Returns -1 for anomalies/outliers and +1 for inliers. Opposite of the Local Outlier Factor of X. It is the opposite as as bigger is better, i.e. large values correspond to inliers. Only available for novelty detection (when novelty is set to True). The argument X is supposed to contain new data: if X contains a point from training, it considers the later in its own neighborhood. Also, the samples in X are not considered in the neighborhood of any point. The score_samples on training data is available by considering the the negative_outlier_factor_ attribute. The opposite of the Local Outlier Factor of each input samples. The lower, the more abnormal.